Sergeant Jorge Chavez was recently diagnosed with leukemia. Sergeant Chavez has served with the Los Angeles County Sheriff’s Department for 17 years. Sergeant Chavez is in need of a lifesaving marrow donor. There is currently no matching donor for Sergeant Chavez but with the bone marrow match drive, you can make the difference. Join Cerritos Station as we host a fundraiser barbecue in front of the Sheriff station today, January 12, 2017 from 11 am to 3 pm. See the flyer for more information and how to donate. This fundraiser will go on, rain or shine. Accommodations will be made for the weather. 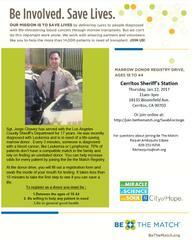 City of Hope will be at Cerritos Sheriff Station to conduct a bone marrow donor drive. You will fill out a registration form and swab the inside of your mouth for testing. It takes less than 10 minutes to take the first step to see if you can save a life.